The books shown immediately below are being provided to each participant. The authors, each a speaker, will be available to inscribe each book honoring each participant. The books are listed in alphabetic order by title. Insights into how the world’s top innovators implement their innovation strategies. What the world lacks right now—especially the United States, where every form of organization from government to banks to labor unions has betrayed the public trust—is integrity. 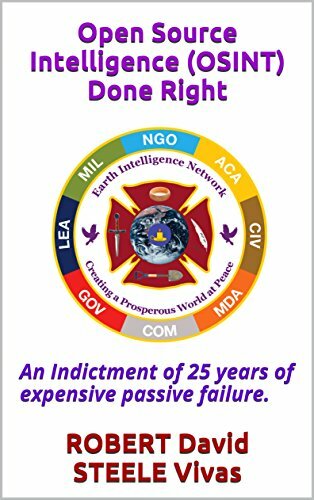 Also lacking is public intelligence in the sense of decision-support: knowing what one needs to know in order to make honest decisions for the good of all, rather than corrupt decisions for the good of the few. 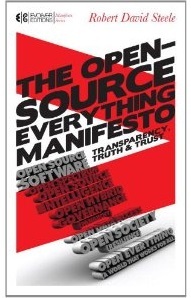 The Open-Source Everything Manifesto is a distillation of author, strategist, analyst, and reformer Robert David Steele life’s work: the transition from top-down secret command and control to a world of bottom-up, consensual, collective decision-making as a means to solve the major crises facing our world today. The book is intended to be a catalyst for citizen dialog and deliberation, and for inspiring the continued evolution of a nation in which all citizens realize our shared aspiration of direct democracy—informed participatory democracy. Open-Source Everything is a cultural and philosophical concept that is essential to creating a prosperous world at peace, a world that works for one hundred percent of humanity. The future of intelligence is not secret, not federal, and not expensive. It is about transparency, truth, and trust among our local to global collective. Only “open” is scalable. In the first in a new series of easily digestible, commute-length books of original philosophy, renowned thinker John D. Caputo explores the many notions of ‘truth’, and what it really means. John D. Caputo explores the problems posited by the way in which science, ethics, politics, art and religion all claim to offer us (the) “truth”, defending throughout a “postmodern”, or “hermeneutic” theory of truth, and posits his own surprising theory of the many notions of truth. Bottom line up front: truth in transit is truth in the becoming, the event, the conversation, the evolution — all men are created equal was initially all white elites; then all white men; then including slaves generally of color; then women; and now evolving to include transgender and perhaps one day, animals other than humans and even plants.